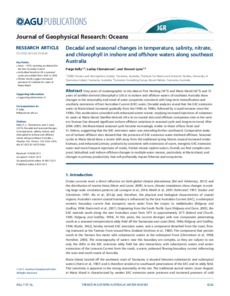 Sixty years of oceanographic in situ data at Port Hacking (34°S) and Maria Island (42°S) and 15 years of satellite-derived chlorophyll a (chl a) in inshore and offshore waters of southeast Australia show changes in the seasonality and trend of water properties consistent with long-term intensification and southerly extensions of East Australian Current (EAC) water. Decadal analyses reveal that the EAC extension water at Maria Island increased gradually from the 1940s to 1980s, followed by a rapid increase since the 1990s. This acceleration coincided with enhanced winter nitrate, implying increased injections of subantarctic water at Maria Island. Satellite-derived chl a at six coastal sites and offshore companion sites in the western Tasman Sea showed significant inshore-offshore variations in seasonal cycle and long-term trend. After 2004–2005, the Maria Island seasonal cycle became increasingly similar to those of Bass Strait and St. Helens, suggesting that the EAC extension water was extending further southward. Comparative analyses of inshore-offshore sites showed that the presence of EAC extension water declined offshore. Seasonal cycles at Maria Island show a recent shift away from the traditional spring bloom, toward increased winter biomass, and enhanced primary productivity consistent with extensions of warm, energetic EAC extension water and more frequent injections of cooler, fresher nitrate-replete waters. Overall, we find complex temporal, latitudinal, and inshore-offshore changes in multiple water masses, particularly at Maria Island, and changes in primary productivity that will profoundly impact fisheries and ecosystems.